Miss. A is a highly qualified surgeon with a very good practice. In my quest to find a financially empowered woman for my podcast series (where I talk to women who are in charge of their financial life), I reached out to her to check how she manages her money. Her response was that this was something that her husband was handling and although he involved her in all the discussions around money, to the extent of ensuring that she was around for meetings with the financial adviser, she could not rake up interest in this subject! She joked that she could tell me where to spend the money but planning finances was not her cup of tea. Miss. B is a teacher and has been teaching for the past 15 years. I met her at a common friend’s place where I was asked for my opinion about buying jewellery. While I went about explaining why gold—especially jewellery—is not a great investment, Miss B exclaimed that their earnings are for spending, enjoying life today and the savings and investing are something that her husband would take care of. I recently had the opportunity to have financial awareness sessions for teachers at some educational institutions and found that most of the women lecturers invest in gold jewellery from what is left of their income after the expenses. In fact, even teachers of postgraduate management courses (some of them from finance background) too were very conservative as far as investments were concerned, and stuck to traditional instruments like gold and insurance policies. Miss. C is a senior employee and business head of a unit at a large corporate. The corporate had invited me for a talk on money management for its women employees. Almost every session that I go for, the business leaders concur on why financial literacy for women is so important. Miss C mentioned that despite the hectic work schedule, she had been saving and investing in mutual funds and wanted to check what I thought of her investments. I was not at all surprised to find out that she had invested in unit-linked insurance plans (Ulips) simply believing her financial adviser from a leading bank, who had positioned Ulips as mutual funds. Miss. D is an entrepreneur and is part of various industry bodies and does a lot to promote women’s empowerment. I have met her a couple of times at various events and she recently connected to take some financial advice. Apparently, her husband had been investing heavily in real estate using his savings as well as taking loans, while she was taking care of the day-to-day expenses. They were leading a very lavish lifestyle and their only son was studying at an expensive international school. The husband had some losses in his business due to which that business had to be shut. So now, they had most of the money stuck in real estate and she being a co-borrower had to pay the EMIs as well as take care of regular expenses and pay for her son’s education. The common thing among all these women is that they are all highly educated and successful, but are financially illiterate and will be ill-equipped to manage their finances in case of contingencies. Why only these women, this is true for a large majority of women worldwide. Most women don’t tend to handle money till there is a life-changing situation, which propels them to do so. But if women can perform complicated surgeries, can code amazing programs and apps, can fly planes, why can they not manage their money? While women are adept at mutli-tasking, money management seems to be the least of their priorities. So on this Women’s Day, I would urge women to do something that is the ultimate ‘EmpowHERment’—own your financial future. Yes, there may be little time left after work, daily chores, taking care of the house, kids etcetera, but if you can make time for checking the best deals for shopping, you can take out 1 hour a month for managing your finances. This attitude that my money is for spending and the husband will take care of the long-term finances, is absolutely wrong. Women need to be equally involved in managing family finances. I am not saying that you must not trust your husband but how do you know he is investing the right way? Has he done financial planning? In my experience, the husbands themselves take hurried financial decisions and invest randomly. I have found most people to be very careful and thorough in their professional work. Shouldn’t the same checks apply for your finances? Why do people, time and again, fall for unscrupulous bankers’ advice? Spending 1 hour a week reading up on various personal finance topics is a good way to start. I see too many women living for today, without worrying about their future. Unless you create a financial plan and know what it takes to reach your financial goals, you will never really have the time to do what you want to in your life. Happy women’s day and happier Financially Empowered Women (F.E.W.). 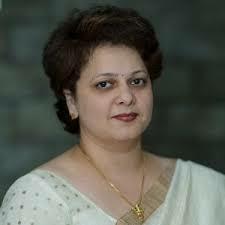 Ms. Mrin Agarwal is financial educator; founder director, Finsafe India Pvt. Ltd; and co-founder, Womantra.